When the Dallas area was being settled by American pioneers, many of the settlers traveled by wagon trains along the old Shawnee Trail. This trail was also used for cattle drives north from Austin. This trail later became the Preston Trail, and later, Preston Road. Preston Road is one of the oldest north-south roads in all of Texas. With all of this activity, the community of Lebanon was founded along this trail and granted a U.S. post office in 1860. In 1902, a line of the St. Louis-San Francisco Railway was being built through the area, and periodic watering stops were needed along the route for the steam locomotives. The current settlement of Lebanon was on the Preston Ridge and was thus too high in elevation, so the watering stop was placed about four miles (6 km) to the west on lower ground. A community grew around this train stop. Residents of Lebanon actually moved their houses to the new community on logs. The new town was originally named Emerson, but that name was rejected by the U.S. Postal Service as being too similar to another town in Texas. In 1904, the residents chose Frisco City in honor of the St. Louis–San Francisco Railway on which the town was founded, later shortened to its present name. 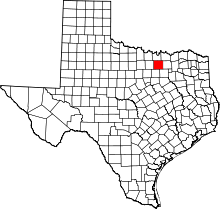 Frisco is located in western Collin County and eastern Denton County at 33°08′29″N 96°48′47″W﻿ / ﻿33.141263°N 96.813120°W﻿ / 33.141263; -96.813120 (33.141263, -96.813120). As of the 2010 census, there were 116,989 people living in Frisco, up from the previous census in 2000, with 33,714 people. Frisco took a different economic track than many surrounding cities and elected to use a fractional percent of local sales tax to fund the Frisco Economic Development Corporation (FEDC) rather than DART, the regional transportation body. The effectiveness of the FEDC, whose primary purpose is to reallocate such tax dollars to commercial ventures, is a matter of public debate. Frisco also built Frisco Square, a mixed-use development that will become the new downtown. Frisco Square has about 250 rental residential units, seven restaurants, about 40,000 square feet (3,700 m2) of commercial office space and a few personal service locations. The major development in the project is the new City Hall and main library and a public commons. A Cinemark theater opened in December 2010. In 2012, a hospital, Forest Park Medical Center, was built north of the theater. Most of Frisco is within the Frisco Independent School District (Frisco ISD). Some parts extend into Lewisville Independent School District, Little Elm Independent School District, and Prosper Independent School District. Frisco ISD has eight high schools, sixteen middle schools and forty elementary schools. All Frisco high schools compete in 5A because of the addition of 6A schools to Texas. The Early Childhood School is available for children ages three and four who meet eligibility requirements for Headstart, Prekindergarten, or Preschool Program for Children with Disabilities. Frisco also has the Frisco ISD Career & Technical Education Center(CTE or CaTE Center), a building in which students from high schools can experience and try different careers, from veterinary work to advertising, and graphic design. Frisco has built the Frisco Athletic Center that features 18,000 square feet (1,700 m2) of indoor aquatics elements and about 40,000 square feet (3,700 m2) of outdoor aquatic features. Some area residents refer to this as the "Rec Center" or "F.A.C." It features upscale exercise equipment, as well as group exercise classes. Frisco is home to several sporting venues, a NCAA Division I conference headquarters, a NHL hockey team headquarters, a Major League Soccer team, a junior ice hockey league headquarters, a Minor League baseball team, and an NBA D-league team. The Dallas Cowboys moved their headquarters to Frisco in 2016. Frisco is home to a variety of sporting venues. The Dr Pepper Ballpark, a 10,600-seat baseball stadium, hosted its first baseball game on April 3, 2003. It was named the best new ballpark that year by BaseballParks.com, and received the 2003 Texas Construction award for Best Architectural Design. Toyota Stadium, which was opened August 6, 2005, as "Pizza Hut Park", is a 20,500-seat stadium. It is primarily used as a soccer stadium by FC Dallas, but also hosts concerts, local high school football games and college games, specifically the I-AA (FCS) football championship starting in 2010. The Dr Pepper Arena, a combination hockey and basketball venue, is the home of the Texas Legends of the NBA Development League, the North American Hockey League franchise Texas Tornado, and a practice facility for the Dallas Stars of the NHL. The Dallas Cowboys moved their corporate headquarters to Frisco in time for the 2016 NFL football season, the complex opened in June 2016. The 91-acre Dallas Cowboys project "Frisco Stadium" includes the team's new headquarters and training facilities. One of which is Ford Stadium, where FISD High Schools and the Dallas Cowboys practice and occasionally play. It is located on the corner of the N. Dallas Tollway and Warren Parkway. It boasts state of the art training facilities and practice fields, a luxury hotel, high-end retail shopping and restaurants, and a 12,000 seat indoor stadium where the Frisco Independent School District high school varsity boys play home games during the regular high school football season. The Southland Conference, an NCAA Division I athletics organization, relocated its headquarters to Frisco in 2006. On February 26, 2010, it was announced that Pizza Hut Park (now called Toyota Stadium) in Frisco would become the host of the Football Championship Subdivision (formerly NCAA Division 1-AA) championship game, formerly held in Chattanooga, Tennessee and Huntington, West Virginia. The first matchup, hosted by the Southland Conference, was played January 7, 2011. The Dallas Stars NHL team is headquartered in Frisco, and the team practices at the Dr Pepper Arena there. The Texas Tornado of the North American Hockey League have been based in Frisco since the fall of 2003, and shortly afterward the NAHL moved its main offices to Frisco. In the 2013 off-season, the Texas Tornado relocated to North Richland Hills, Texas. The Texas Legends, affiliated with the Dallas Mavericks, play in the NBA Development League. They play at Dr. Pepper Arena. Frisco is home of the Superdrome, an outdoor velodrome. Frisco also has an Olympic-size state-of-the-art natatorium. The Frisco Baseball & Softball Association (FBSA) has been in action since its establishment in 1984. The Frisco Football League (FFL) is an organized recreational league that allows children to play football before entering football in the school district. The Flagfootball4fun Flag Football League (FF4FUN) is an organized recreational youth flag football league that is the largest NFL flag football program in Frisco. 1 2 "Geographic Identifiers: 2010 Census Summary File 1 (G001): Frisco city, Texas". U.S. Census Bureau, American Factfinder. Retrieved July 30, 2015. 1 2 "Demographics". friscotexas.gov. Retrieved July 19, 2016. ↑ "Frisco, other Dallas-area cities among fastest-growing in U.S.". Dallas Morning News. 2010-06-23. Retrieved 2010-09-29. 1 2 3 4 City of Frisco, Texas POPULAR ANNUAL FINANCIAL REPORT September 30, 2013 (PDF) (Audited Report). City of Frisco, Texas. June 21, 2014. Retrieved June 21, 2014. ↑ Texas Almanac. "Texas Almanac: City Population History from 1850–2000" (PDF). Retrieved June 21, 2014. ↑ United States Census Bureau. "Census of Population and Housing". Retrieved June 21, 2014. ↑ "Population Estimates". United States Census Bureau. Retrieved June 21, 2014. ↑ Data Access and Dissemination Systems (DADS). "American FactFinder". census.gov. Retrieved June 5, 2015. ↑ "Star Local". Star Local. Retrieved June 5, 2015. 1 2 "Frisco's Dr Pepper/Seven Up Ballpark". BaseballParks.com. Retrieved 2006-07-13. 1 2 "Texas Construction's Best of 2003 Awards" (PDF). Retrieved 2006-07-14. ↑ Caplan, Jeff (February 26, 2010). "Division I adopts 20-team bracket, moves FCS title game to Frisco, Texas". ESPN. Retrieved 2010-02-26. ↑ "Nagin reports to federal prison in Texarkana." KSLA. September 8, 2014. Retrieved on June 2, 2015. ↑ "." CBS DFW. October 6, 2016. Retrieved on October 21, 2016.